The measures to cool the property market may have weeded out a large part of speculative activities but they have not succeeded in curbing rising prices, says Malaysian Institute of Estate Agents (MIEA) president Siva Shanker. “The number of transactions has come down but prices continue to rise steadily,” he said at the Property Investment Convention 2014. 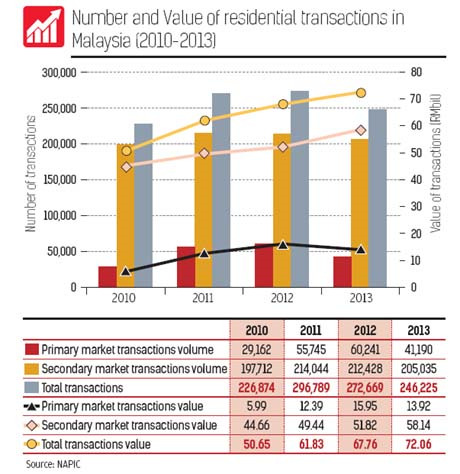 Siva said the number of transactions between 2011 and 2012 dropped by 0.67% but their value increased by 3.61% while between 2012 and 2013, the volume dropped 10.85% while the value rose by 6.7%. “A drop of 10.85% is substantial but you have the value of transactions moving up 6.7%. That means prices of properties are continuing to rise,” he said. The measures included the removal of developers’ interest scheme (DIBS), hike in real property gains tax (RPGT) rates and for mortgage loans to be based on the net price of the property. Siva said that rebates offered by developers such as “free” legal fees and stamp duty contributed to the rise in property prices. During the same event held last weekend, a property developer openly offered an 18% discount. The gross selling price of the unit was reduced from RM900,000 to RM711,000 as a result of freebies. “When a property price is artificially inflated this way, the gross price is stated in the sales and purchase agreement. This gives the developer the opportunity to price his next launch at a higher price, which explains why prices are going up indiscriminately. “The developer gets a great take-up rate during his launches and the first batch of buyers are happy but the overall market suffers in the longer term,” he said, adding that the secondary market was obviously gaining interest. Siva said another issue he was concerned about was the the existence of investor clubs. “Although these clubs are less active today, they are still there. The minute the market turns, they will come back. The authorities should outlaw these clubs today or regulate them. The market cannot afford to wait two to three more years before doing something about these clubs,” said Siva. Raine & Horne Malaysia (Penang) senior partner Michael Geh said during a panel discussion that the Government should say that over a 20-year cycle, property prices have moved up by as much as 45% on a national basis after an economic crisis but dropped by a fifth in each recession. “In the 1986 recession, prices dropped 20% over a two-year period but during a seven-year upturn, prices went up 45%. During the 1997/98 Asian financial crisis, prices went down 20% but rose by much as 45% after that for another seven years or so. “Between 2008 and 2010, the market was down by another 20% but from 2009/2010 onwards, it has been rising. It is still rising today. But salaries have not risen in tandem,” said Geh. Geh added Malaysian car prices were among the top three highest in the world and there was no light rail transit in Penang, Sabah and Sarawak while Johor was promising.